Kissing bugs in Ohio - Do we really need to worry? The chances of encountering this bug in Ohio and being bitten are very slim. However it is worth being educated on so that you know what to look out for. The kissing bug has been known to be in the United States since the 1800’s. While it may look like just another beetle, it is actually a potentially harmful pest. In extremely rare cases the disease they spread with their bite can be deadly. There are approximately 11 species of this creepy crawler throughout the United States and they are capable of spreading Chagas disease. However in Columbus, Ohio there is little need to worry! Only one out of the eleven species has been found in Ohio. The “kissing bug” nickname comes from the way they feed which is by biting the face. The spread of Chagas is caused through a parasite that spreads through their feces. After the kissing bug bites, it defecates near the site of the bite. The danger of Chagas disease comes when the feces is spread into the bite and infects the victim through the bloodstream. Kissing bugs are nocturnal and typically found outdoors. In Ohio, the scientific name for the one species of kissing bug that lives here is Triatoma Sanguisuga. They mainly reside in the more southern Ohio counties near animal nests. Is the “kiss of death” something you really need to worry about? The only notable increase in Chagas disease has been in the southern states. 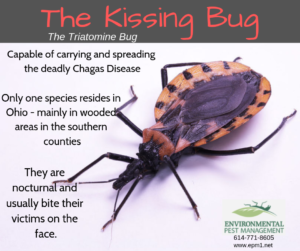 While it is good to stay informed – for now, Ohioans need not to really worry about these notorious kissing bug and Chagas disease. If you spot what you think may be a kissing bug, take a second look before you panic. It is much more likely to be an imposture! While there is no specific pesticide on the market for the kissing bug, you can take preventative measures to ward off harmful pests by getting on a program. Read more about our P3 program by clicking here! Holiday Travel Plans? Follow these bed bug prevention tips.